In astronomy, Eridanus is the name of a southern constellation. It stretches from near Rigel (Orion) to the South Polar Circle. 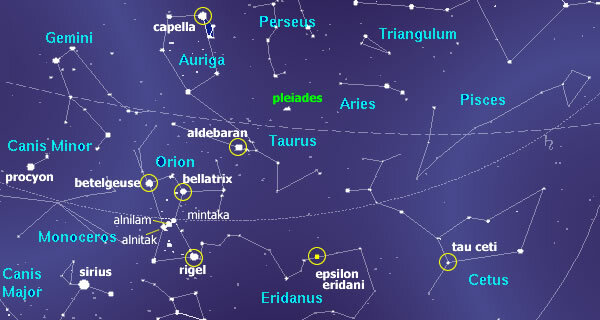 One of its star systems, Epsilon Eridani, is inhabited by a humanoid race. They are believed to member of the Federation of planets, and to be one of the races that have contacted the US government to express their concern (Branton). Epsilon Eridani is approx. 10.8 Light Years away from Earth. "Another contact that has been going on since October of 1969, and still continues, involves a life-form from another atmospheric planet orbiting a sun some 20 light years away near the star we call Epsilon Eridani. We believe the star indicated to be 82 Eridani as this is a G5 star quite similar to our own sun which is in spectral class GOand is about the right 20 light years distance away. These creatures were larger, like 7 to 7.5 feet tall, and were covered with wrinkled skin and had very large arms with 3 fat fingers on the end. The skin has plates and wrinkles, something like crocodile skin. They had strange faces and a large mouth and very large ears, but they, like the Iargans demonstrated a highly advanced technology." The Branton material, in Mojave II, quotes the "Ufo Journal of Facts, Spring 1991" that tells the story of the recovery of a crashed craft with a mediterranean or latin american looking alien. "His skin was a bronze color, reminiscent of Mediterranean or South American cultures. His hair was similarly brown and very short in a Roman or crew style cut. The only real difference in appearance from earth humans were that his ears were slightly pointed." The inhabitant confirmed to be from Epsilon Eridani. One source, Chuck Roberts, mentions a nordic race ('blonds') of Lyran descent, but I haven't found confirmation on that.